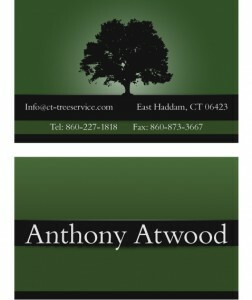 A simple business card made for CT-Tree Service of East Haddam CT. Customer asked for leaves everywhere, trees being pruned, and a lot of messy stuff all over the place. But sometimes less is more and simplicity sells. The picture to the left shows the font and back of the card. The EVX project was named so because of the size and operation. The bike’s projected curb weight should be around 80lbs and be slightly larger than a mountain bike. EVX will sport 2 power packs holding 20x 3.2v 15ah cells each, giving the bike a total of around 60v at 30ah. Originally we were planning to go with the PMG 132 permanent magnet, brushless motor. Since the initial design Agni motors has started producing the Agni95, a motor that weighs less has higher rpms and producing more power with an efficiency rating of 93%. Ciurrently this motor is the best you can buy for lightweight and cost effective electric vehicle applications. A few weeks ago Annikka from Orchid Gifts Madeira contacted me about a limited edition piece of jewelry they would be offering. I was commisioned to design the card backing for these necklaces made from Madeira’s natural beauty. 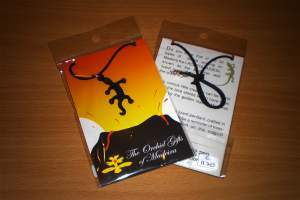 The pendant is lava carved into the shape of lacerta dugesii, Madeira’s only known indigenous reptile. 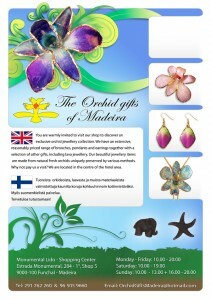 Lately I have been working with Annikka at Orchid Gifts Madeira (OGM). They have some of the most unique and beautiful jewelry I have seen. As the name suggests (OGM) produces pendants, earrings, and other jewels from Madeira’s flowers and other natural resources. This is a full page (size A4) ad to be used in an information guides for tourists and will be placed in hotels. There are 4 versions of the ad; English, Finnish, Danish, and English and Finnish together. The version pictured left is one that will be framed in a plaque. The empty space at the top will hold a real sample of the jewelry sold at The Orchid Gifts of Madeira.